Do women know how they’re doing in the economy? For those keeping score, women nabbed most of the new jobs last month, making up two-thirds of net nonfarm payroll growth, according to government data released Friday. 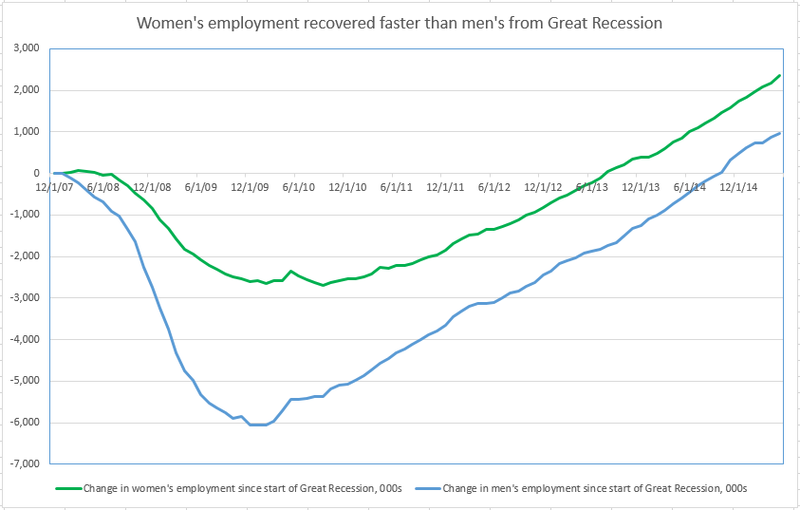 Longer-term trends show that women’s employment gains have far outpaced men’s since the start of the Great Recession. Women hold almost 2.4 million more jobs than they did at the end of 2007, when the downturn began, compared with men’s gain of less than 1 million. This is all good news for women, with the caveat that they dominate relatively low-wage industries. But since the report was released, I find myself wondering: How many women know about how they are faring in today’s economy? I don’t expect many people to tune into the daily spewing of economic data from the government, industry and think tanks. But when there’s a blockbuster jobs report, the kind that influences the most powerful regulators and lawmakers in the world, I hope that adult women are aware that something important is happening. Women are underrepresented among business and economics reporters. Looking at my personal sample size of one, among people who follow my economics Tweets, only 16% are women. One of my former editors recently reported that less than one-in-10 women “frequently discuss saving and planning for retirement with family and close friends.” And according to the American Press Institute, an Arlington, Va.-research group, about 76% of men follow business and economy news, compared with 65% of women. Women tend to earn less than men, heightening the importance for them to pay attention to their finances, as well as local and national economic trends. A woman who is aware that there’s a bias in the distribution of, say, wages, is one who has knowledge that can arm her in the fight for equal pay. A woman who knows which occupations are growing and where can make informed career choices. Next Next post: Who cares about valuing household work? Insurers.